If you are the 'Techno Classica 2020' Five Day Classic Car Show organiser and you would like to update or amend the details shown, please contact us. Thank you. When is the next Techno Classica 2020? Wednesday 25th to Sunday 29th March, 2020. Techno Classica 2020 is listed under March 2020 Classic Car Shows. Although we try to keep the information for this event as up to date as possible, we cannot guarantee that things haven't changed at the last minute, and we haven't been informed. Therefore, please contact the 'Techno Classica 2020' event holder directly to confirm all details (especially event name, dates and location) before setting off to Norbertstraße 2. 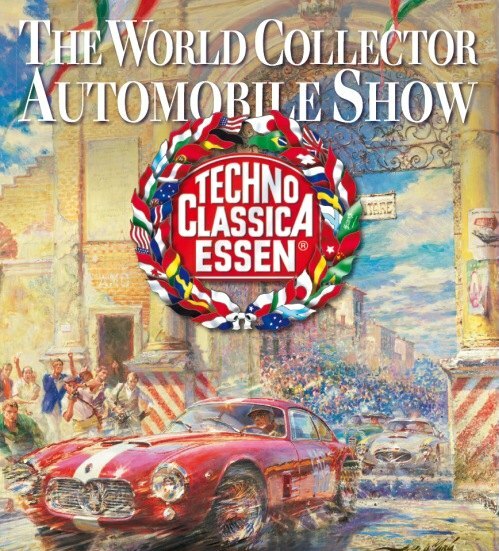 The Techno Classica 2020 is planned to take place at Essen Messe, Norbertstraße 2, 45131 Essen, Wednesday 25th to Sunday 29th March, 2020. Billled as the World Show for Vintage, Classic, Prestige Automobiles, Motorsport, Motorcyles, Spares and Restoration, this five day show boasted more than 1,200 exhibitors from 30 nations and over 190,000 visitors from more than 40 nations in previous years. Note that Day 1 is for previews, so Trade and Press Day only.